The City Archive of Leuven has made available for us almost a hundred photographs of Leuven taken between 1839 and 1939. These images have been digitized during the EuropeanaPhotography project and exhibited, among other photographs, in the photography exposition “All Our Yesterdays” that took place from the 1st of February to the 15th of March 2015. 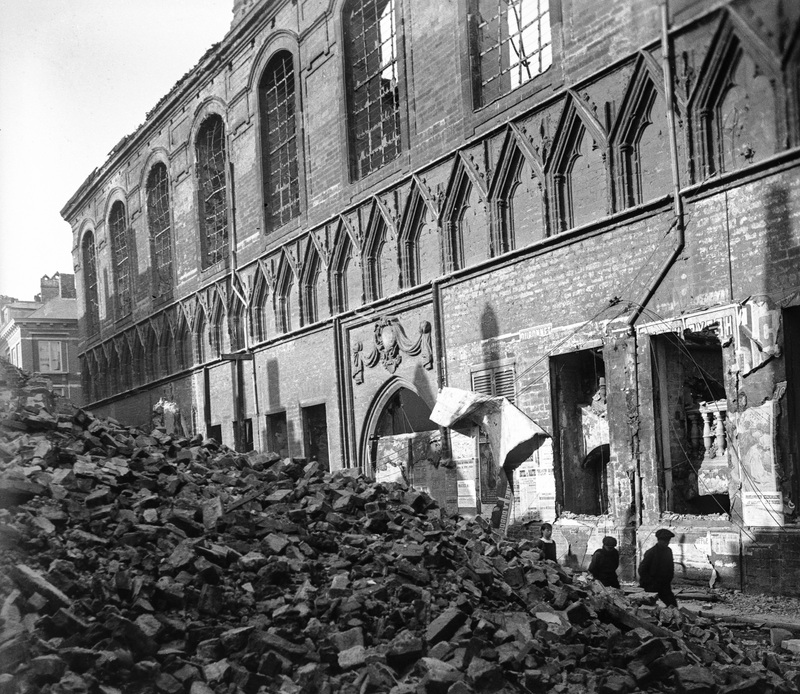 Striking image of what remains of the university hall in the Naamsestraat after the fire of 25 August 1914. The Photography Pilot of the Europeana Space, Best Practice Network is now looking for spaces of possibility for the creative reuse of digitized photographic heritage. Stemming from the idea of developing augmented reality applications that enable historical images to be layered with actual experiences, one of the projects we are working on entails the creation of an algorithm that matches the old photographs of the City Archive with the same places of Leuven today. The algorithm will be integrated in a simple app that allows users to point their phone-cameras to determined places in Leuven and see the old images coming up, accompanied by historical background information and related stories and anecdotes. Not only this app will be of great value for tourists visiting Leuven and citizens who want to rediscover the city through its past history, but we also want to turn it into an entertaining event: we will organize a competition in the form of a Photo Quest, where participants will be challenged to walk around the city and find the places of today that match the old photographs and vice versa. To develop the algorithm and create the app, we need dozens of images taken with slightly different positions, angles, distances, weather conditions, sun position, and so on. During the Photography Hackathon, which will take place from the 25th to the 27th of February 2016, the algorithm will be available to be reused by the participating developers and, if need be, integrated in their own projects. Also the development of the Photo Quest app will certainly benefit from the Hackathon as new and innovative ideas and improvements will be implemented. Through this project, historical photographs of Leuven will come back to life and intertwine with stories and places of today in an exciting way. The past of the city will be just a click away. Stay tuned to read more on our latest developments!